Apparently, F. Scott Fitzgerald wasn’t much of a hockey fan. The American writer so famously penned the words: There are no second acts in American lives. Clearly, he didn’t include Canadians as the Tampa Bay Lightning have announced that they are recalling forward Jonathan Drouin from the Syracuse Crunch to help them finish out the regular season. This is indeed a second chance that many thought would never happen. After being notified by Lightning general manager Steve Yzerman at the beginning of January that he was being sent to Syracuse, Drouin made it known that he was not happy with his overall treatment by the franchise. Sure, he flew to Syracuse and played for the Crunch, the Lightning AHL affiliate, but within 24 hours of this news, Drouin’s agent, Allan Walsh, had notified the media that a trade request was made to the team by Team Drouin all the way back in November. To aggravate the situation even more, after playing a few games for Syracuse, Drouin shut it down. All the way down. He failed to appear for a game, notifying the team that until he was traded he was going home. He literally took his skates and sticks and went home. Granted, there are always two sides to an argument but from a public relations viewpoint, Drouin was not seen as the sympathetic hero in our little story. Fans in Tampa wanted to trade him for a bus ticket. Hell, some in town would have traded him for the promise of said bus ticket. He was all but gone, most thought. He should be, most said. He would never wear the Lightning sweater again, except in the mind of one man perhaps. The one man that held all the cards in this scenario – Yzerman. Reasonable people could see the writing on the wall. Yzerman had to be working the phones throughout the end of January and through most of the month of February as the NHL trade deadline approached. Rumors about the impending Drouin trade actually began to outnumber the “Steven Stamkos is leaving Tampa” rumors. Seemed like NHL experts from Toronto to Vancouver and all points in between were listing the teams that wanted in on a chance to get Drouin. It was not to be. Feb. 29, the deadline for making deals, came and went and Drouin was still in his parent’s basement, still property of the Lightning. Keep in mind that throughout the entire saga, Yzerman has maintained that he would do what he always does. Whatever is in the best interests, in his opinion, for the franchise. After seeing the deadline come and go and he wasn’t moved, Drouin did what was best for Drouin. He headed back to Syracuse. All reports are that he has been the epitome of a model teammate except for one incident in which he was late to a team meeting due to, according to Drouin, a faulty alarm clock. Maybe it was the stars aligning for both Drouin and Yzerman. In hindsight, it certainly looks prudent that Yzerman didn’t trade Drouin. Whatever his reasoning is or was, Yzerman needs to insure that crystal ball of his. Who knew then that Stamkos would have surgery one week from the start of the playoffs? Who knew that the offense would need a shot in the arm come April? So here we are, news of the Lightning recalling Drouin to the big club hit the wires and fans in Thunder Nation are taking sides. Some still want him gone. Some are saying maybe he can help the team out. Others, arms locked defiantly, are taking a wait-and-see approach, either waiting for a Drouin misplay or seeing if he’ll score a goal. Ultimately, what matters here most are Yzerman’s words. To do what is best for the franchise. He did that when he drafted Drouin back in 2013. He did that when he sent Drouin back to the Juniors in Halifax that same year. Yzerman, with tremendous input from his coach, Jon Cooper, did it again last season by keeping Drouin on the Lightning roster. Much to Drouin’s dismay, the Tampa brain trust did it a year ago in the playoffs by sitting Drouin in 20 of the 26 postseason games the team played. Believe it or don’t, Yzerman also did what was best for his organization when he decided on Jan. 2 of this year to send Drouin down to Syracuse. Again, Drouin didn’t agree but owner Jeff Vinik pays Yzerman to make those decisions, not Drouin. Once again, Yzerman is keeping true to his mantra by calling Drouin up to Tampa as the season winds down. The Lightning lost its No. 1 scorer in Stamkos a week after they lost its No. 2 defender in Anton Stralman. Injuries this week have taken out their associate captain Ryan Callahan and its No. 1 defender, Victor Hedman. Yzerman does what he always does. He decides what is best for his team and then he does that very thing. He may not always be right but he is always decisive. As for Drouin, this is your second act, kid. Don’t blow it. You are getting a chance that some players never get. 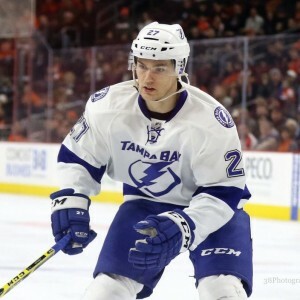 This could be a fantastic opportunity for Drouin. Let’s say that he still wants to be gone from the Lightning. Show the other general managers in the league that you are exactly who everyone thought you were when you were drafted. Show the fans in Tampa that wanted you run out of town that perhaps they judged you too harshly and far too soon. Show Cooper that you belong in a top-six role. You have a chance to showcase all your talent and skills. Let’s take the other side of that coin and say that Drouin has had time to reflect on his actions over the last few months and he wants to stay with the Lightning. What better way to show that and earn the respect of his teammates, fans and especially team management by being not only the player most thought he could be but being a stand-up person in and out of the locker room. Perhaps, Fitzgerald was wrong about second acts. Maybe sometimes some people do get a chance at a second act. If they do, they need to seize the opportunity. Start by getting a good alarm clock.